Native landscaping features native plants and grasses with deep root systems, which create open space in the soil below and allow rainfall to percolate deep into the ground. Native plants are adapted to Iowa's climate and tolerant of weather extremes. They create diverse habitat that attract birds, butterflies, and other wildlife. Most importantly, once established, they don't require fertilizer, pesticides, and supplemental water to survive. If plants native to Iowa are strategically placed, it will enhance the landscape's ability to infiltrate and manage stormwater. 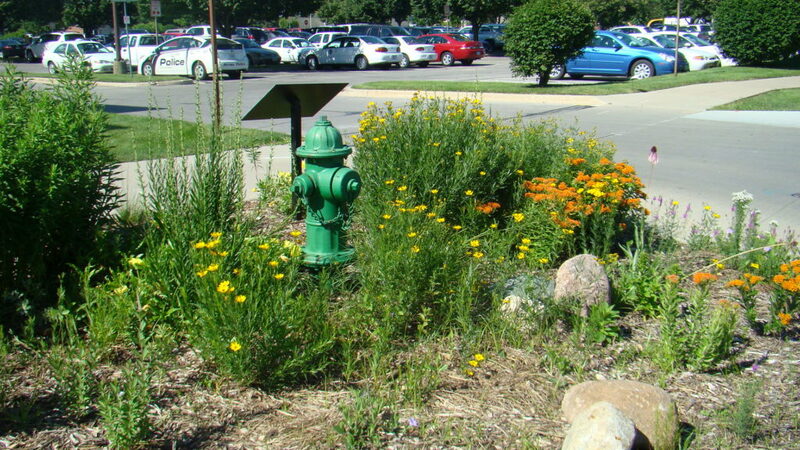 Many of the other infiltration-based stormwater management practices use native plants to add functionality and beauty while being low maintenance. 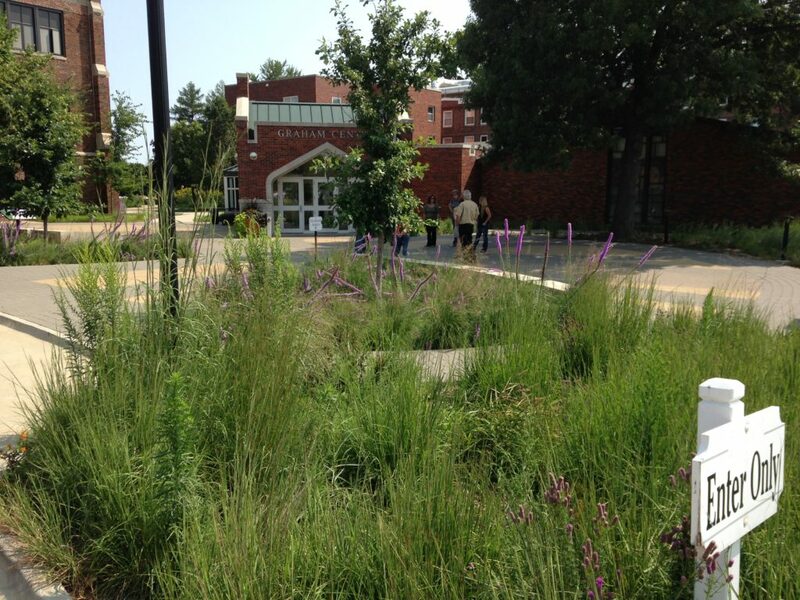 Native plants can replace large expanses of turf grass in parks, yards, and corporate campuses. 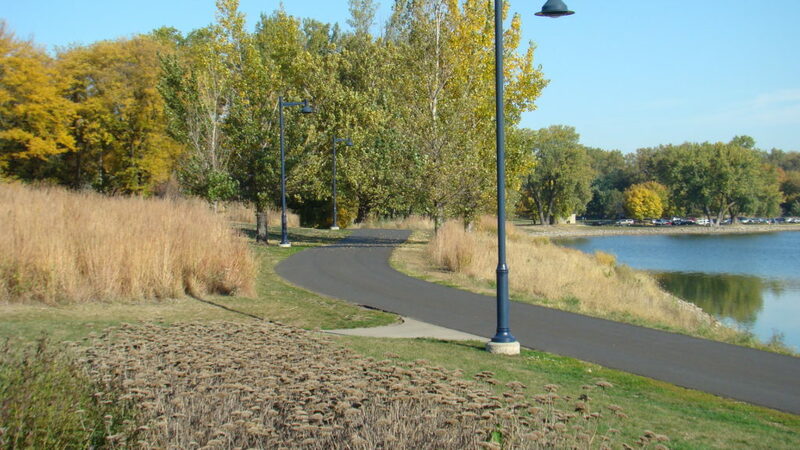 After establishment, native landscaping is less expensive to maintain than mowed turf grass areas. Design procedures generally involve matching plant or seed mix selection to the soils, moisture regimes, and aspect of a site. Plant height, color scheme, and shade or open sun tolerance are considered during plant selection for a site. In residential settings, a dense band of prairie or woodland plants is placed on the downslope side of the property and is used to filter and absorb rainfall and runoff. Use plugs or plants to speed establishment. Mulch the native garden to reduce weed competition. Native nurseries and garden centers have a variety of plants to choose from for small plantings. For larger scale plantings - it is most efficient and cost effective to seed a diverse mixture. Native nurseries have seed mixes to match the conditions of the site. Reference our list of Iowa native seed and plant suppliers to find a source near you! When planning larger scale native landscapes, plan fire breaks for prescribed burning, which is the recommended management/maintenance practice. If code prevents prescribed fire management, periodic mowing and removing residue will benefit the planting. Expect plantings to take two to three years to establish. Mow frequently during the first two years to reduce weed competition. For all plantings - always plant mowed turf borders or low-growing native turf around native landscaping in an urban setting to provide a border and kept appearance. In plantings such as bio-retention areas, consider a border planting of shorter prairie grasses, such as Prairie Dropseed. Border plantings increase social acceptance of native landscaping sites. Design the planting to accommodate fire management whenever possible. Develop all mixtures based on pure live seed. If the site is within one mile of an existing native prairie (not a reconstructed prairie), local ecotypes are recommended.